817-19 St. S.E. 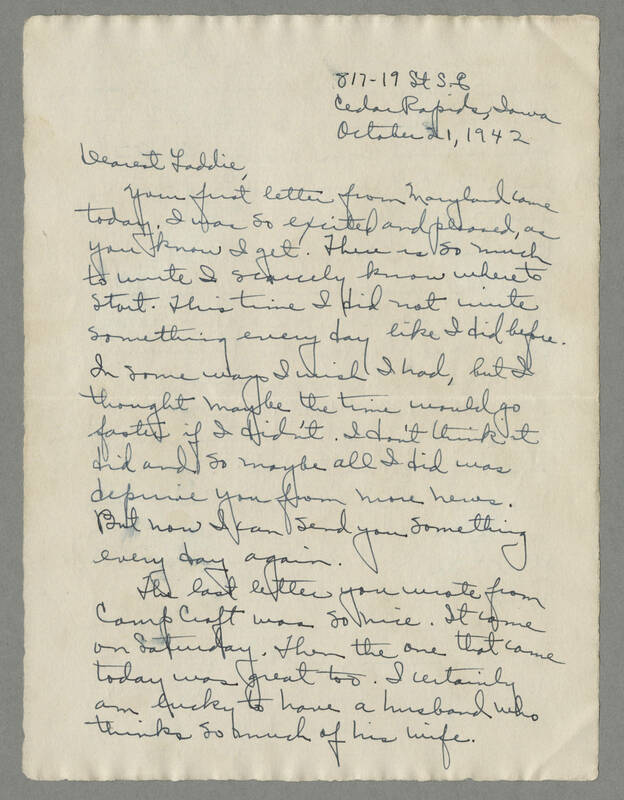 Cedar Rapids, Iowa October 21, 1942 Dearest Laddie, Your first letter from Maryland came today. I was so excited and pleased, as you know I get. There is so much to write I scarcely know where to start. This time I did not write something every day like I did before. In some ways I wish I had, but I thought maybe the time would go faster if I didn't. I don't think it did and so maybe all I did was deprive you from more news. But now I can send you something every day again. The last letter you wrote from Camp Croft was so nice. It came on Saturday. Then the one that came today was great too. I certainly am lucky to have a husband who thinks so much of his wife.